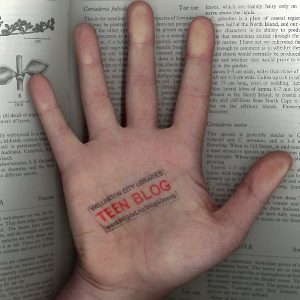 Teen Blog » Blog Archive » New Books! I am typing this in Wadestown library! Sort of like New Books on Tour. Haha. Haaa. Blink Once, by Cylin Busby (290 pages) – West wakes up in a hospital bed, strapped down. He is paralyzed. The girl in the neighbouring bed, Olivia, is the only one who can communicate to him. But why? Why is she in hospital? How is she connected to all his nightmares? What is going on here, guys. Publishers Weekly says that readers rush to the end to answer these questions, and ‘they won’t be disappointed by what they discover’, which is frankly very appealing. The Demon Catchers of Milan, by Kat Beyer (278 pages) – Mia’s distant family from Italy have come to visit. Just in the nick of time! As she has been possessed by a powerful demon, and they are actually all demon hunters. Once her cousins have exorcised her, she heads back to Italy with them to learn Italian, get more involved with the family business (i.e. killing demons) and fall in love with Italians. Not her cousins though! I don’t know. Embers & Echoes, by Karsten Knight (461 pages) – This is the follow-up to Wildefire, about a bunch of gods who have reincarnated as teens. Ashline Wilde is the reincarnation of Pele, a Polynesian volcano goddess, and when her sister is taken by some evil gods she must join up with Wes, a reincarnated Aztec god, who has his own vendetta to hash out. ‘More X-Men than Clash of the Titans,’ says the Library School Journal, which is really quite a compliment. Unfed, by Kirsty McKay (307 pages) – This follows on from Undead, about a zombie apocalypse during Bobby’s school trip. She survived it! Unfortunately, he best pal is missing and it’s up to her to find him in the zombie-infected wastelands AND and find an antidote before it’s all over for the human race. ‘Hysterically funny,’ says The Times. So Close To You, by Rachel Carter (313 pages) – Lydia’s great-grandfather disappeared, along with others, it is rumoured, because of some weird army experiment called the Montauk Project which occurred at the spooky abandoned military base near her home. When a portal opens up and takes her back to 1945, six days before her great-grandad disappears, she becomes part of the experiment. The first in a planned trilogy. Tiger Lily, by Jodi Lynn Anderson (292 pages) – Before Peter Pan met Wendy there was Tiger Lily, who faced all kinds of hurdles to be with Peter (and not this guy her family and tribe wanted her to marry). And then of course Wendy comes along to Neverland on an English boat and things get messy. A clever retelling of the Peter Pan story, as narrated by Tinkerbell. ‘Perplexing’ to those familiar only with the Disney version, which of course doesn’t include any Teen Blog readers. What’s Left of Me : The Hybrid Chronicles, by Kat Zhang (343 pages) – Eva and Addie were born in the same body, but are two distinct souls, or hybrids. However in this alternate reality, hybrids are against the law, so they must keep their dual existence a secret from the government and their family. Reviews say this is very well written, with a great ending, so go on reserve it why don’t you. Don’t Turn Around, by Michelle Gagnon (310 pages) – Noa, a rebellious teen orphan, has woken on an operating table with no memory. She joins with Peter, a computer hacker from a wealthy background, to take down a large and evil corporation. ‘The Girl with the Dragon Tattoo for teens’, a reviewer writes, if that’s a good thing? The Broken Lands, by Kate Milford (455 pages) – This is the prequel to steampunky The Boneshaker, and is set in New York, 1877. Two teenaged orphans – Sam and a pyromaniac girl named Jim – must battle ancient dark forces from turning the city into Hell.